From “Martha Schwartz, Reconnecting” in the July 2017 issue, about Martha Schwartz’s return to the United States from London, her entrance into landscape architecture, and the landscape frontiers of China. From “Martha Schwartz, Reconnecting” in the July 2017 issue, about Martha Schwartz Partners’ mammoth landscape for Beiqijia, a mixed-use development located an hour north of central Beijing. Back from a dozen years in London, the designer is focusing on climate and the world she has made her home. THE FOLLOWING IS AN EXCERPT FROM “MARTHA SCHWARTZ, RECONNECTING” IN THE JULY 2017 ISSUE OF LANDSCAPE ARCHITECTURE MAGAZINE. FOR THE FULL ARTICLE, PLEASE SEE THE MAGAZINE. Martha Schwartz, FASLA, and her business partner and husband, Markus Jatsch, last year relocated from London to Brooklyn, though the London office remains the headquarters of their firm, Martha Schwartz Partners. Schwartz continues to teach at the Harvard Graduate School of Design—though her projects have taken her firm just about everywhere but the United States. James Trulove, a former editor of LAM, who has known Schwartz for years, joined her and Jatsch, who is trained as an architect, for a conversation to find out what prompted the move and where Schwartz is directing her design and teaching now. James Trulove: You now have offices in New York, London, and Shanghai. I guess there are many opportunities for a landscape architect in China given the enormous amount of construction that is taking place. What is it like to work there? Placing Martha Schwartz, FASLA, the past decade has been tricky to folks in the U.S. She has been teaching here, but otherwise has been anywhere else, working away. Now Schwartz has moved back to New York and says she wants to reconnect with her home ground. James Trulove talks with Schwartz in the July LAM about her practice and teaching, a focus on climate hazards, and recent work in China, where Trulove visited two projects in Beijing. Liz Sargent, FASLA, doesn’t have a slick website or a press packet, but chances are you’ve probably been to one of the cultural landscapes she’s worked on, including nine U.S. World Heritage sites, 33 National Historic Landmarks, and more than 50 National Park Service sites. Kevan Williams takes a deep dive into her work documenting the Blue Ridge Parkway. Being online means consenting to leaving a trail of personal data wherever we go, but what does consent mean when you’re in public space? Data-tracking furniture in our parks and cities can have a lot of community benefits, but is the technology way ahead of the privacy conversation? Brian Barth looks into the systems that are looking into us. 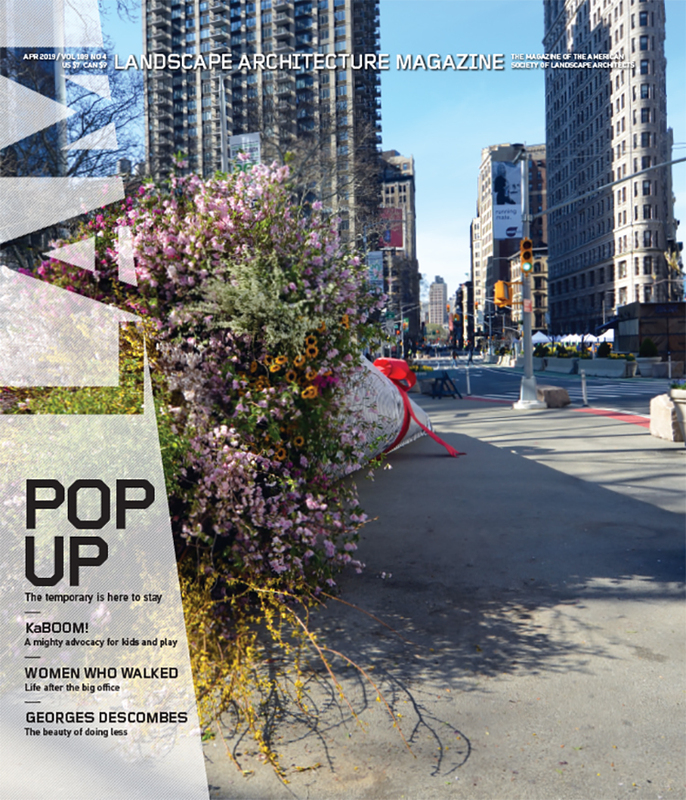 Also in this issue: podcasts for designers, not just about them; Meg Calkins, FASLA, on new sustainable concrete products; and just in time for your summer road trip, Jane Gillette reviews landscape architect Jack Williams’s Easy On, Easy Off: The Urban Pathology of America’s Small Towns, a book about how highways helped shape the country. The full table of contents for July can be found here. Credits: “Disrupting the Park Bench,” Melissa Gaston; “Context Clues,” Liz Sargent, FASLA; “Martha Schwartz, Reconnecting,” Sahar Coston-Hardy; “Concrete Minus Carbon,” Chicago Department of Transportation; “Reopened for Business,” EPNAC.COM; “Pictures in Sound,” Courtesy Mark Morris, ASLA.